Musicalia.com.do is an Internet webpage programmed by the ASP language, reason why its content is 100% dynamic, handled by means of a database, from the texts that appear, to the products in each category and orders. This webpage also has a shopping cart where the client can add the products he/she wishes to purchase, there is also the option to add more than one of the same type of product at a time, as well as deleting or removing an item previously added. The user fills out a form with the contact information and the address where the product will be delivered. All of this is handled by means of a database. The area of administration is very complete, you can add, modify, and delete all the products, as well as see all the details in each order. All of this with an account assigned by the administrator of the webpage (the number of accounts is unlimited). APP Solutions offers Hosting Service with a 99.9% uptime commitment. We have our own dedicated server, giving us full control over our servers. We offer dedicated servers and VPS (Virtual Private Server). Our support team is available 24/7 365; all services are monitored 24 hours a day. Applications included on all hosting plans: SQL Server 2005, MySQL, ASP Classic, ASP .Net 1, 2, 3 y 4, PHP5, advanced statistics and much more. We offer E-mail service with accounts up to 10GB. All services come with a 99.9% uptime commitment. Our support team is available 24/7 365; all services are monitored 24 hours a day. Do you need a website? APP Solutions offers websites development service. All our website are 100% managed by a Control Panel developed by us to each client, adapted to the client needs. This way, each client can manage the website without maintenance fees. 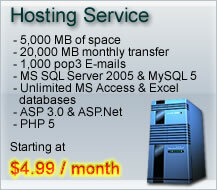 All websites developed by us comes with a FREE Hosting service for 2 years. The emerging trend of programs for companies are the Web-based programs. The benefits are endless: no need to install any additional software on the PC, simply open your browser and you are ready to use all program features. If your server is connected to the Internet you can access the program from anywhere in the world. Your customers can send orders to you, see the history of their orders, change profiles, etc., and all this simply by using your browser. APP Solutions develops these applications customized to your business, adapting it to your requirements, giving rise to a custom application to your needs as a company.